Fish and humans are alike in visual stimuli perception — Ben-Gurion U. 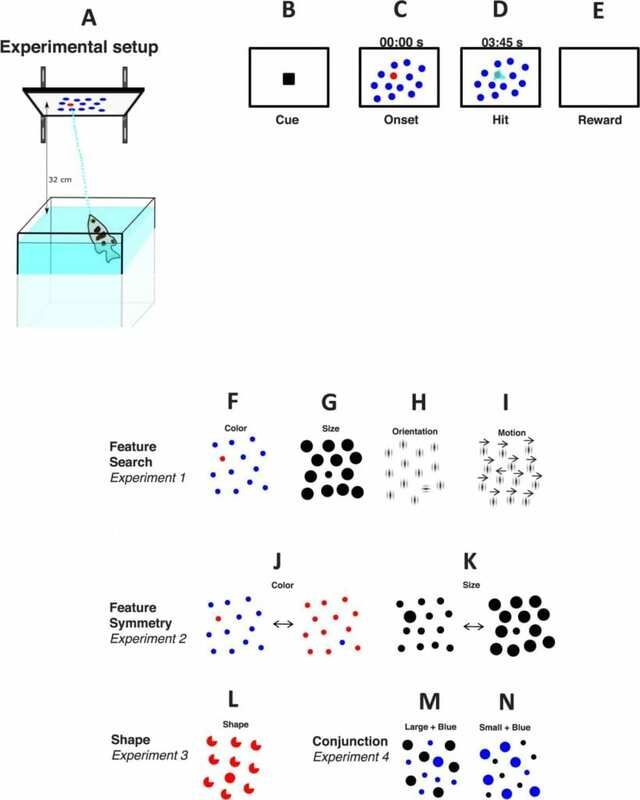 Fish and humans are alike in visual stimuli perception -- Ben-Gurion U.
BEER-SHEVA, Israel…February 4, 2019 – Humans, fish and, most likely, other species rely on identical visual features — color, size, orientation, and motion — to quickly search for objects, according to researchers at Ben-Gurion University of the Negev (BGU). The study published in the Journal of Vision involved target-training archerfish, a species with unique visual hunting skills that is widely used in experiments that evaluate visual perception. Click here to watch a video of the experiment. In their natural habitat, archerfish hunt by spitting a jet of water at insect prey on overhanging leaves to dislodge and eat them. BGU researchers trained the fish to distinguish between objects on a computer monitor above them and shoot at a desired target. By doing so, the fish were able to participate in a controlled experiment the same way humans do: simply by watching a computer screen and answering questions. Learning more about which features pop out for different species against distracting backgrounds and recognizing variabilities– what is the same and what is different — is important for understanding how animals target what they need to survive, reproduce and avoid predators. “There is extensive evidence that color, size, orientation, and motion are the most efficient features for guiding a human’s attention. We found the same universal features will also make a target pop out against a busy background for animals with very different brain anatomies and living environments,” says Professor Ohad Ben-Shahar, the chair of BGU’s Department of Computer Science. While the researchers confirmed that the same four visual search cues work for humans and archerfish, they question whether this is also true for other vertebrates, birds and amphibians. In addition to pinpointing the most effective visual cues, the BGU researchers were also able to identify that both humans and fish find it more difficult to target an object with a different shape or juxtaposition within a busy background. The research team also included Adam Reichenthal, a graduate student in BGU’s Department of Life Sciences and the Zlotowski Center for Neuroscience, and Dr. Mor Ben-Tov, a BGU graduate who is currently a postdoctoral fellow at Duke University. Funding was provided by the Israel Science Foundation (Grant 211/15), the Binational Science Foundation (BSF; Grant 2011058), the Frankel Fund at BGU’s Department of Computer Science, and the Helmsley Charitable Trust through the ABC Robotics Initiative of BGU.